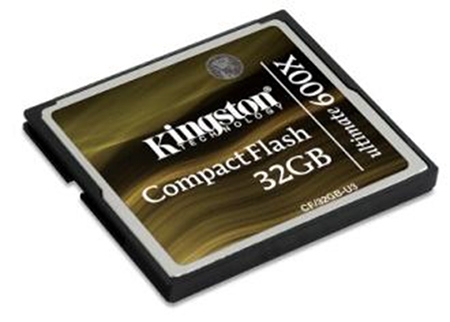 "Kingston has released its CompactFlash Ultimate 600x memory cards. Available in 16GB and 32GB capacities, the Kingston CompactFlash Ultimate 600x cards support UDMA mode 6 and offer read and write speeds of up to 90MB/sec. Backed by a lifetime warrenty, the cards are priced at £170.85 (32GB) and £97.55 (16GB). For added peace of mind, the price of theCF Ultimate 600x cards include free downloadable data recovery software from MediaRECOVER." CompactFlash may be a dying memory card standard, but Kingston and professional photographers the world over still have a lot of love for this format - and I do as well. Although things are looking better for the speeds of SD cards with the release of UHS cards, right now CompactFlash wipes the floor with SD cards in the speed department. 32 GB of storage this fast would simply be awesome...you could shoot all day and never have to charge cards!